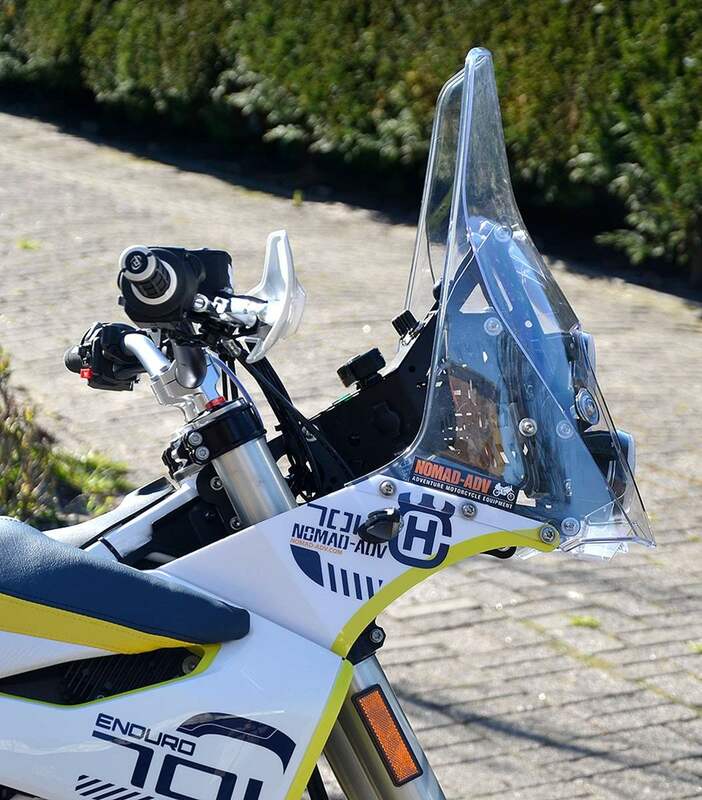 Right from the start we wanted our Husqvarna 701 Nomad to look and feel like a proper Husqvarna should. We also wanted nothing but top quality materials and workmanship in order to achieve the level of quality we were after. We do all our machining in-house, apart from the laser cutting, to get the level of quality we want. This is not a middle of the road adv kit but a top spec, road legal and long range travel bike, and unlike others comes at a reasonably price. 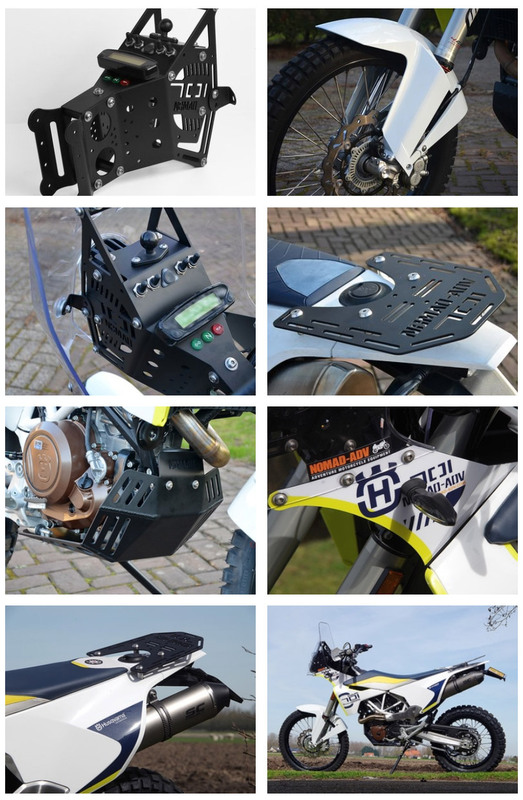 We use the KTM 450RR Rally screen which has been tested in the Dakar at speeds of 170 km/hr(!) and has proven to work. Heated grips, heated vests and being able to charge a multitude of digital gizmos is no longer just a luxury, so we accommodated for it. It's also one of the reasons why we use LED headlights (which are E-marked for road use), to reduce the power drawn from the charging system, which means you have more available for accessories. We didn't go the easy way and fit the dinky little ones used elsewhere (most of which aren't E-marked) but opted for the Cyclops plug and play long range units in optional beam pattern choices.. Yes they are more expensive but they give a serious amount of light and have the option to change the type of beam by simply changing the cover. We made each headlight individually adjustable in all directions. Cyclops Long range lights offer a usable light of up to 850ft in spotlight form. The light kit we have comes complete with protective covers, which have a silicone seal to prevent dust between cover and light. Adventure tower or Rally tower? Well, actually both. The tower was originally designed as an Adventure tower. We used all our experience and technical knowledge done up in the field (which culminated into a motorcycling world record) to build a tower that works for a traveler. Most rally towers block too much of your vision. You can't see the front wheel when going slowly over the remains of that old bridge or the rock and hole infested track leading up to it, and they are too high. When you look at the photos you'll see that, unlike with most rally towers, a large portion of the KTM Rally screen fitted to our adventure tower is un-blocked to allow full view of what's ahead. And that is despite having the tallest GPS fitted in the photo, as a conventional Motorcycle GPS is much lower and can be fitted as well. But then we started to received more and more comments that it has all the basics to make it into a very good rally tower as well… That's why we've developed, together with a rally bike builder, a rally kit for it. It's a simple yet flexible and sturdy addition to the Nomad tower, which can be bolted on without disassembling the tower. For more details see here. There is plenty of vision on each side of the tower, which is kept as narrow as possible. Inside the tower you'll find the original Husqvarna wiring, no need to cut and splice, it's all out of the weather and no dangling mess of wires on the outside either. All the power for charging points and switches comes through it's own cable and fuses, directly from the battery. We're thus not putting any extra strain on the original wiring. Your warranty is thus unaffected.